SHE WOULDN'T SAY YES is an occasionally silly yet most enjoyable example of one of my favorite kinds of movies, the romantic comedy. Spending time with this film and its cast is great fun. Rosalind Russell, in one of her patented "career woman" roles, plays Dr. Susan Lane, a psychiatrist. Thanks to a little help from a matchmaking railway ticket agent, Susan is thrown together time and again with Michael Kent, a cartoonist heading west for army duty. Michael is immediately head over heels for gorgeous Susan, but uptight Susan has seen too many patients with relationship problems and thinks she doesn't want a man in her life. Michael's got just a few days to change Susan's mind before he's off to the war. Russell is quite beautiful as Susan, and she's got a way with a deadpan one-liner like no one else. She takes a little too long coming to her senses, but it's fun getting there. The underrated Bowman does a fine job as the persistent suitor; in the wrong hands Michael could have seemed a bit like a stalker, particularly in the last section of the movie, but Bowman conveys Michael's sincerity and decency. The train scenes are particularly enjoyable, especially the sequence in the crowded club car where Michael manages to get Susan a seat. There's just nothing quite like a movie set on a train; I've recently come to the conclusion that movies and trains are a match made in heaven. The supporting cast is terrific, starting with Harry Davenport as Susan's ex-hobo butler and Charles Winninger as her physician father. Sara Haden is Susan's secretary, and Percy Kilbride has a couple funny scenes as a justice of the peace. Adele Jergens is an excitable woman who becomes Susan's patient during the train trip, while Mary Treen and Arthur Q. Bryan are also train passengers. Cartoon fans will recognize Bryan's voice immediately...I won't spoil the surprise, but it's fun to see a face to put with the voice. Bit roles are played by many familiar faces including Willie Best, Sam McDaniel, Clarence Muse, Mantan Moreland, Tom Dugan, Edward Gargan, Darren McGavin, Carl "Alfalfa" Switzer, Cora Witherspoon, and more. It's a wonderful cast down to the smallest parts. SHE WOULDN'T SAY YES was directed by Alexander Hall, whose films include the romantic comedies THE DOCTOR TAKES A WIFE (1940), BEDTIME STORY (1941), HERE COMES MR. JORDAN (1941), and Rosalind Russell's MY SISTER EILEEN (1942). It was shot in black and white by Joseph Walker and runs 87 minutes. 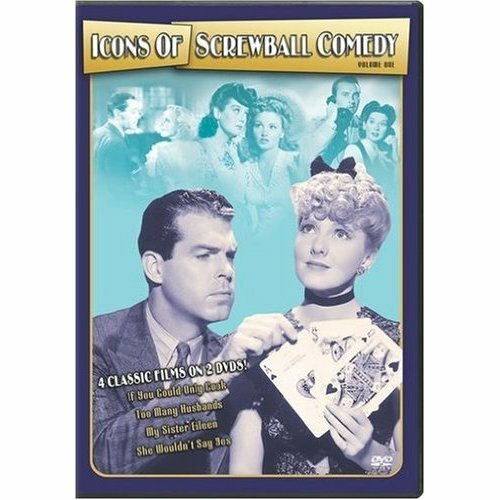 SHE WOULDN'T SAY YES is part of the new Icons of Screwball Comedy, Volume 1 DVD set. The print is excellent. 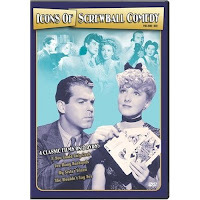 The other films in the set are Russell's MY SISTER EILEEN (1942) and Jean Arthur's IF YOU COULD ONLY COOK (1935) and TOO MANY HUSBANDS (1940). 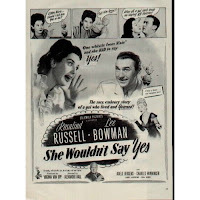 SHE WOULDN'T SAY YES is a Columbia film which has been shown on Turner Classic Movies as recently as this past weekend; click here for a page to suggest that it be scheduled again. Ha! I had tee-voed that movie and watched it this morning. Roz is one of my favorites and I had never seen this movie before! I'm glad you got to see it, Terri! Hope you had as much fun watching it as I did.